Vinitaly International, the true ambassador of Italian wine, poured wines from northern, central, and southern Italy at the San Francisco Winter Fancy Food Show, a leading trade expo which featured more than 25,000 visitors. After this first stop for 2019, Vinitaly International will return to California in February to stage the Vinitaly International Academy (VIA) Ambassador course in Los Angeles and educate local wine professionals about Italian wine. Vinitaly International’s first mission for its 2019 tour took some of the best Italian wines to San Francisco, California, where the 44th edition of the Winter Fancy Food Show was in full swing from January 13th to 15th at the Moscone Center. For the third year in a row, Veronafiere and Vinitaly International spread the gospel of Italian wine culture through numerous wine tastings which were held in the Italian pavilion and were organized in cooperation with ICE – Italian Trade Agency (ITA) and its New York office. Organized by the Specialty Food Association, the Winter Fancy Food Show is the largest trade show devoted to food and beverage on the West Coast, where the most influential decision-makers in the retail, foodservice, e-commerce, and hospitality sectors gather annually to do business. The 2019 edition of this large-scale convention featured an exhibition space of more than 200,000 square feet, 1,400 exhibitors from around the globe, 80,000 specialty foods and beverages, and the industry’s top networking events. 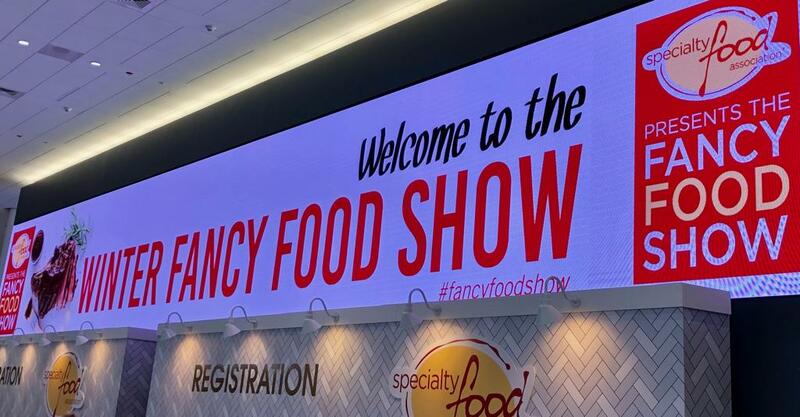 Due to its interactive character, the Winter Fancy Food Show offered unique opportunities to experience the latest trends in food and beverage through numerous educational seminars, tastings, and cooking demos. According to the first estimates, more than 25.000 food and beverage professionals attended the Winter Fancy Food Show in San Francisco this year. This high turnout provided the Vinitaly International’s Italian wine bar and the wines it featured great visibility on each day of the event. 2019 will be crucial for the Italian system in the United States. According to data from the U.S. Department of Commerce referred to the first 10 months of 2018, the Italian exports of food and beverage resulted in a total of 4,274 billion dollars, gaining 9,5% over the previous year. Now more than ever, Vinitaly International is committed to elevating the image of Italian wine with the U.S.A., the most important wine market for Italian wine. Left to right: Lorenzo Ortona, Italian Consul General in San Francisco; Maurizio Forte, Italian Trade Commissioner Executive Director for the U.S.A.; Armando Varricchio, Ambassador of Italy to the United States; Phil Kafarakis, President of the Specialty Food Association; Donato Cinelli, CEO at Universal Marketing. 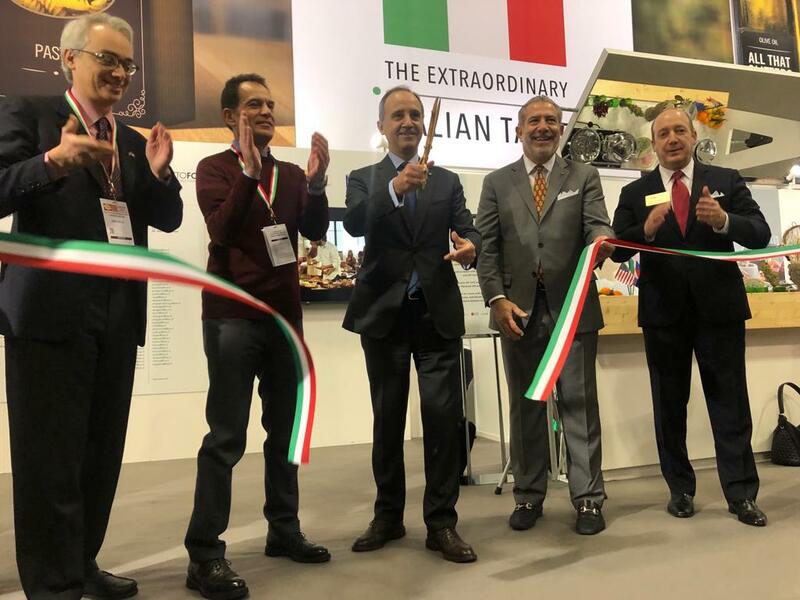 The show opened on Sunday January 13th in the morning, when the Ambassador of Italy to the United States Armando Varricchio performed the ribbon-cutting ceremony. President of the Specialty Food Association Phil Kafarakis, Italian Consul General in San Francisco Lorenzo Ortona, and Italian Trade Commissioner Executive Director for the U.S.A Maurizio Forte were also present. Set up by ICE – Italian Trade Agency in New York in cooperation with Universal Marketing, the Italian pavilion held more than 50 exhibitors and featured three of the most important Italian trade shows in the field of food and beverage: TuttoFood in Milan, Cibus in Parma, and Veronafiere’s Vinitaly inVerona. For three days Vinitaly International presented wines from various regions of Italy, from North to South, with a different wine list being showcased each day. Prosecco DOC offered by the Consorzio di Tutela del Prosecco DOC was the protagonist of the first day due to its huge popularity in the U.S.. The wine selection included La Marca Prosecco DOC extra dry, Mionetto Prestige Prosecco DOC Treviso brut, Valdo Prosecco DOC brut, and Villa Sandi Il Fresco Prosecco DOC Treviso brut. On the second day, Vinitaly International celebrated central Italy. The Consorzio Tutela Morellino di Scansano DOCG and the Consorzio Tutela Vini Maremma Toscana provided a fine selection of Tuscan red wines. The wine list included seven Morellino di Scansano DOCG labels and one red Maremma Toscana DOC. This last one was the La Chimera D’Albegna Caletra 2012 vintage. Visitors of the Winter Fancy Food Show had the opportunity to taste Morellino di Scansano DOCG from the 2016 and 2015 vintages: Tenuta Pietramora Brumaio, Germile, Morisfarms, and Pietramora for 2016; Doga delle Clavule and Conte Guicciardini Massi di Mandorlaia for 2015. A Morisfarms Morellino di Scansano Riserva DOCG 2011 was also poured. The third and last day was devoted to southern Italy in partnership with Lyra Fine Wine Importers. Four different labels and wineries from the Campania, Abruzzo, and Sicily regions were presented. Three white wines—Fattoria La Rivolta Fiano Sannio DOC 2016, Benanti Etna Bianco DOC 2016, and Ciavolich Donna Ernestina Passerina IGT 2017—opened the wine list, followed by a rosé, Paolo Calì Osai Frappato Rosato IGT 2016. Vinitaly International will be back to California from February 18th to 22nd, to stage the VIA Italian Wine Ambassador certification course in Los Angeles. Funded by ICE – Italian Trade Agency, this tasting-intensive course provides in-depth knowledge of Italian wine, along with a lot of background information, historical references, and food culture. The certification enables candidates to further their careers in the wine sector and connects them with peers all over the world, to spread, in turn, knowledge of Italian wines in their respective markets. Enrollment for the Los Angeles edition of the VIA Ambassador course is still open. Sector professionals and experienced wine lovers are welcome to submit their candidacy for this rewarding course. For further information, visit the Vinitaly International Academy website or email via@vinitalyinternational.com.